Fig. A-428. Todd-AO 128° "Bugeye" lens on its base, mounted in the "Bugeye" Carrying Case. This case will carry either this lens and base or a complete Bugeye camera with the lens base and camera mounted together. The Todd-AO Camera Lenses are of a radically new type and they are a basic element in the Todd-AO Process. Because of their design, there is no simple meaning to a focal length designation. Therefore, they are identified by the horizontal angular field covered by them when used on the Todd-AO Camera. At present, there is a compliment of four such lenses accompanying a camera. These four are the 128° or "Bugeye", 64°, 48°, and 37°. Because angular coverage is an unfamiliar designation, it was felt by some people in the industry that a simple letter designation in addition to the angular field might be helpful. Therefore, the 128° is called the "A" lens, the 64° the "C" lens, the 48° the "D" lens, and the 37° the "E" lens. It will be noted that no "B" lens is listed. This was omitted because it was felt that at some future date a fifth lens between 128° and 64° might be desirable. Fig. B-87. Todd-AO 64° f/2.2 Camera Lens. Because of its large size, the 128° lens has a different mounting than the other three. This can be seen in the "Bugeye" Camera illustrations in Volume I of this catalog. The remaining three lenses are mounted by a simple Bayonet type of lock and are termed the "Bayonet Lenses". All of these Bayonet Lenses are interchangeable. All Todd-AO Camera Lenses are coated to increase light transmission and reduce flare. Fig. B-72. Todd-AO 48° f/2.0 Camera Lens. Todd-AO 48° f/2.0 Camera Lens. Fig. B-73. Todd-AO 37° f/2.8 Camera Lens. Todd-AO 37° f/2.8 Camera Lens. Fig. B-78. Interior of Todd-AO Bayonet Lens Carrying Case, showing the 37°, 480, and 64° lenses in place. Fig. B-79. Bayonet Lens Carrying Case for Todd-AO 37°, 48°, and 64° lenses. Fig. B-82. Special Todd-AO Wide-angle Matte Box for use with the Todd-AO Bayonet Lenses. It provides for two filter holders, one of which may be used for the Pola-Screen holder which is supplied with the matte box. Fig. B-81. Rear view of the Todd-AO Special Wide-angle Matte Box showing the Pola-Screen in place. Fig. B-80. Exploded view of the Special Todd-AO wide angle matte Box. Fig. A-427. Todd-AO Bayonet Matte Box and Accessory Case. The upper drawer contains the complete matte box assembly including the hinge assembly, two long and two short iris rods, and the matte box. The remaining two drawers may be used for filters, camera tape and other small accessories. Fig. B-66. Todd-AO Wide-angle Follow Finder with the 64° Finder Adaptor mounted on it. The cam followers can be seen mounted on the bottom. These erect image Follow Finders are fitted with three adaptors which cover the complete range of angular coverage of the Todd-AO Lenses. The 37°-48° Finder Adaptor is the equivalent of the widest angle standard finder adaptor available today. The 64° Finder Adaptor converts the finder for use with the 64° Todd-AO lens. The 128° Finder Adaptor covers the full angular field of the 128° "Bugeye" Lens with enough field to spare so that a small portion of the scene appears outside of the matte bars when they are set for 128°. This gives the operator advance warning of objects coming into the camera field. Fig. B-65. Todd-AO Wide-angle Follow Finder, front view showing the 64° Finder Adaptor. The matte bar adjusting knobs are engraved for the four Todd-AO Lenses and provision is made for adjusting the matte bars independently and locking them in any relative position for exact framing. The Finders are equipped with cam followers for the parallax correcting cams on the Bayonet Blimp. Fig. B-67. Todd-AO 37°-48° Finder Adaptor. Fig. B-68. Todd-AO 64° Finder Adaptor. Fig. B-69. Todd-AO 128° Finder Adaptor. Fig. A-424. Todd-AO Finder Carrying Case showing the Wide-angle Follow Finder, 37°-48° Finder Adaptor, 64° Finder Adaptor, and 128° Finder Adaptor. This unit makes a very convenient package for a "director's finder" as well as for use on the Todd-AO cameras. Adaptor lenses for the follow finders. From left to right 135˚, 64˚, and 48˚ adaptor lenses. 135˚ and 64˚ follow finder adaptor lenses. 135˚ follow finder adaptor lens. Rack-over finder, front view with Todd-AO frame mask. 64˚ follow finder adaptor lens. Camera lens and accessory case. Fig. A-273. Interior of 65mm Todd-AO Camera Magazine. 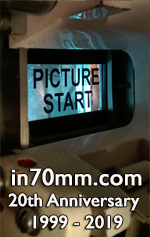 The Camera Magazines are designed to handle 65mm film. The film core spindles are fitted with a keyway for key-type cores and with a re- moveable key for keyway cores. The earlier magazines have plain bearing throat rollers while the newer ones have ball-bearing throat rollers. The inside throat rollers in all magazines have "buried" flanges to help prevent edge shaving and run-off due to poorly spooled film. These flanges are "buried" so as to prevent the film from ever running up on the flanges if a slack loop should form. Magazine chamber covers are of the conventional screw type. Fig. B-86. Right hand side of Todd-AO Camera Magazines showing large pulleys and pulley protecting blocks. Large pulleys provide for using larger than normal take-up spool. These pulleys are protected from damage by blocks around the edges of the magazine at its inherent strong points. Thus the magazine may be laid flat on a table without fear of damage to the pulleys or shafts. Fig. A-275. Todd-AO High Speed Camera Magazine, especially balanced for use with the Todd-AO High Speed Camera. Fig, A-274. Bottom view of Todd-AO High Speed Camera Magazine.